All bike riders should wear bicycle helmets. Each year in the United States, about 800 bicyclists are killed and another 500,000 end up in hospital emergency rooms. About two-thirds of the deaths and one-third of the injuries involve the head and face. Wearing a helmet can reduce the risk of head injury to bicyclists by as much as 85 percent. What safety information should I look for when purchasing a helmet? If considering a used or hand-me-down helmet, never purchase or use a helmet that is cracked, broken, or has been in a crash. Keep in mind that used or older helmets might have cracks you cannot see and might not meet current safety standards if manufactured before 1999. How can I tell if my bicycle helmet fits properly? When the chin strap is buckled, a bicycle helmet should have a snug but comfortable fit. You should not be able to move the helmet from side-to-side or up and down. The helmet should sit level on the head (NOT TILTED BACK) and rest low on the forehead. The bottom edge of the helmet should be one to two finger widths above the eyebrow. Another technique to check proper positioning is this: your eyes should be able to see the very edge of the helmet when looking upward. The straps of the helmet need to be even and should form a "Y" that comes together right at the bottom of the earlobe. The straps should be snug against the head. The buckled chin strap should leave only enough room to allow one finger to be inserted between the buckle and chin. When opening your mouth, you should be able to feel the helmet pull down on your head. 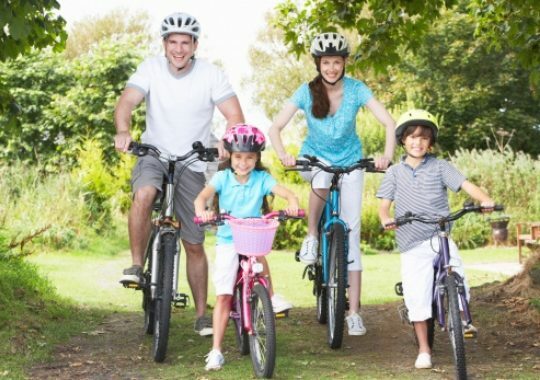 Bicycle helmets are available in several different sizes and with different thicknesses of internal padding to custom fit the helmet to the user. To get a snug fit, internal pads should be placed in areas where there is space between the head and the helmet along the front, back, and/or sides of the helmet. The pads should be positioned evenly around the inside of the helmet. If the helmet does not feel snug after adjusting the pads and when the straps are correctly buckled, try adjusting the pads again or try another helmet. If you are still having trouble, ask a knowledgeable salesperson to help you. Keep in mind that you should not be able to remove a properly fitted and strapped-on helmet from the head despite any degree of twisting or pulling. To encourage your child to wear a helmet, start the helmet-wearing habit early. All bike riders — including those riding a tricycle — should wear bicycle helmet. As long as the helmet fits properly, let your child pick out his or her helmet. They’ll be more apt to wear a helmet if they have selected it. Adults should set an example and wear a helmet themselves when biking. Can bicycle helmets be worn for head protection in other sports? Bicycle helmets can also be worn when in-line skating or roller skating. Skateboarders or skaters who perform tricks might want to look for helmets specifically designed for these activities and that meet safety standards for these sports. These helmets cover more of the head, especially the back of the head.